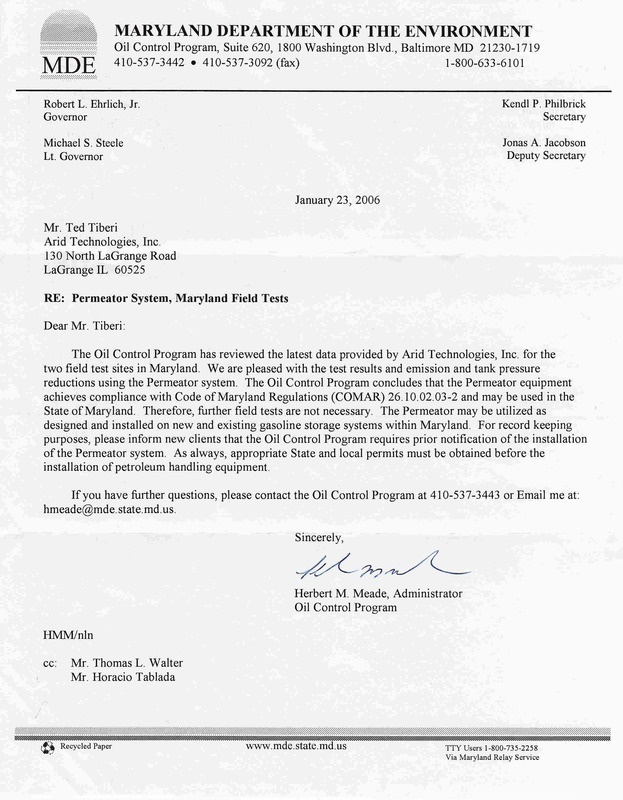 Wheaton, Illinois - ARID Technologies, Inc. announced that the Maryland Department of the Environment (MDE) certified on January 23, 2006 that ARID Technologies' PERMEATOR gasoline vapor containment system achieves compliance with the Code of Maryland Regulations (COMAR 26.10.02.03-2), and it can be utilized on both new and existing gasoline storage systems within Maryland. The state was "pleased with the test results and emission and tank pressure reductions using the PERMEATOR system." The State of Maryland has enacted recent emergency legislation to reduce MTBE, benzene, toluene, ethyl benzene, and xylene contamination of groundwater drinking wells. The cause of this contamination has been directly associated with "below grade vapor emissions". In turn, the root cause of the below grade vapor emissions is elevated storage tank pressures generated from the incompatibility of Stage II vapor recovery systems refueling ORVR equipped vehicles. ARID's PERMEATOR system alleviates this problem by selectively separating air from hydrocarbons; exhausting clean air to the atmosphere, and returning enriched hydrocarbon vapors to the gasoline storage tanks. ARID's President & Founder, Ted Tiberi, said, "In comparison to other approved alternatives such as monitoring wells and soil vapor extraction systems, PERMEATOR represents an elegant solution to this pervasive contamination problem. In addition to reducing groundwater contamination and air pollution, PERMEATOR provides a rapid payback on invested capital by recovering high concentrations of hydrocarbon vapors and allowing petroleum marketers to re-sell the same volume of product which they purchased via the bulk tanker. A typical refueling site operator can save 10 to 20 gallons per day of fuel by using PERMEATOR. For larger refueling sites, the savings can measure up to 40 gallons per day." a. Test the system for vapor leaks, using the MDE protocol, prior to start-up. b. Test for leaks all spill catch basins and containment sumps. c.	Test for leaks all spill catch basins. Every Two Years test for leaks all containment sumps. ARID Technologies, Inc. is a recognized leader in membrane based gasoline vapor recovery technology. ARID has over 136 systems installed worldwide: Europe, Japan, S. Korea and domestically in California, Nevada, Texas, Florida, Delaware, and Maryland. For additional information on PERMEATOR, please contact Mike Heffernan at 630.681.8500. View the official certification from Maryland.